I. Love. This. Book! I am a sucker for any post-apocalyptic book. I am a sucker for any book that gets mired into teeny, tiny details. I am a sucker for smart and witty books. I am a sucker for a good story. After only 10 minutes of listening, I felt he wrote this book just for me! I was tickled to find out it was going to be a movie. I thought that Mark Wahlberg was starring in it, which was good, but later learned it was Matt Damon, which is even better! The movie opens in October and I will carve some precious time from my schedule to get to the theatre! The books are always better than the movies, but I'm always hopeful. I gave a full review here but the short version is "Amazing book! Why haven't I read this before?" I was raving about my love of The Martian and all things post-apocalyptic to another industry professional and she responded with her love of The Martian and all things post-apocalyptic. We are now book buddies! She recommended this Young Adult book which sparked her love of survival tales. It was short and succinct and I have already requested the next in the series. Since I listen to books while I'm quilting, the book doesn't have to be great; it just has to be interesting. This was one of those books. It wasn't great, but it had a lot of twists and turns and kept me guessing until the end. This was a Deal of the Day book and I am always interested in finding a better way to deal with the "stuff" I have accumulated. This book didn't do that. It was a general overview of what clutter is and a few stories about people dealing with their piles, but I can't recommend this book. Although I have watched James Bond movies my whole life, never have I ever read one of the novels. I decided to start at the beginning with Casino Royale. I am very well acquainted with the plot of the movie and was surprised at how closely the movie followed the book. Since the book was over 50 years old when the movie was made, they had to make some changes to make it seem current. As soon as I finished the book, I watched the movie because because Daniel Craig. Sigh. This is the sequel to Hatchet. These are outdoor survival novels for tweens. Fast paced and easy to read, it was a quick listen and short enough that I finished the book while quilting after dinner! My husband and I have been watching/listening/discussing a lot about WWII lately so this a timely read for me. Sparked by Hilter's mass book burnings, the US put books millions of books into the hands of our soldiers during the war. This was a really interesting account of how the book program started, how it got bogged down in politics, the impact those books had on individual soldiers, and the lasting impact of a well-read military. I just keep requesting the next book in the Hatchet series and the library keeps getting them for me quickly! John Boy narrated this one (the other ones were narrated by Peter Coyote). The author indulged himself and wrote his own alternate universe: What would have happened if....? Basically, if the ending of the first book had been different, this would have been the second book. Another quick-moving adventure book for young boys. It's a fun listen even though I am neither young nor a boy. here and there, but it was a fascinating read/listen. If I I only knew humans by the characters in this book, I would think that all men are rubbish (they aren't), that infidelity is a bad idea (it is), and that there are no good people on earth (there are). I disliked every single character and still read the book to completion. To say that I liked this book would be incorrect, but it was engaging. It was like watching a train wreck in slow motion (pun intended) and I couldn't look away. I think I need to read Pollyanna or The Little Princess or some other feel-good book soon else I'll give up hope for humanity. Imperfect people dealing with difficult subject matter, this was a well-written book that kept me riveted. Even though I couldn't connect with the mother, I cared about what happened to these people and needed to know how their story ended. Sadly, this book ended too soon. I want to know more. I'm always desperate for the story after the story, y'know? I get a lot of my audio books on CD from my local library, but I also have and Audible account. It is worth every penny to me! Amazon is offering a special promotion if you want to check out Audible and see if you love it, too. I recently finished another block in my Jinny Beyer block of the month quilt. This White Oak Basket makes me happy and sad. I'm happy because of the appliqued handle. I really, REALLY like that deep handle. I'm sad because of the basket brim. I didn't get it cut just right. I'm going to leave it but I'm not going to be thrilled with that part of this quilt ever. Even though the optional applique might cover up the basket brim that makes me unhappy, I am choosing to not applique flowers onto this block. I'm working with the "done is better than perfect" philosophy. I used a bunch of soft blues/greens/aquas from my Cutie stash. This quilt is so soothing! Sometimes,I just let the quilt tell me what it wants. This quilt wanted some swirls! In case you've lost track, this is my third Sweet Tooth quilt. When will I stop? The April block for Craftsy's Jinny Beyer block of the month was called Pine Needle Basket. New for this month's block was Paper-Piecing. Have you ever taken a paper-piecing class from me? No? Well, there's a good reason for that. I don't DO paper-piecing! I guess I do now! I am piecing this entire quilt with DecoBob from WonderFil. It's an 80 weight poly thread and pieces like a secret! I worried that the thread wouldn't withstand the "rip out the paper" part of this process, but I didn't pop a single stitch! I am piecing on my Janome 6600 and never have I ever used the scissor button before. I just discovered that the scissor button was designed for paper-piecing. It is ah-ma-zing! Once again, Jinny gave me the option to add applique flowers to this block and, once again, I am declining her thoughtful invitation. This shall remain a basket empty of flowers. What new skill might I learn with the next block? I'm home for a few days this week between teaching trips and working on my Jinny Beyer block of the month quilt. It was such a beautiful day that I had to pin up my block on the laundry line! Are you working on this quilt? Do you have plans to finish it before the end of the year? I love the busy autumn months when the weather becomes cooler, the leaves change color, and I'm ridiculously busy running from quilt show to store event to quilt guild. I look forward to this season every year, but I never remember the hecticness of it until it starts again. Well, it started again. When I am not traveling to teach, I am home working furiously to support all of the upcoming events. Every minute counts and I don't have a second to waste. Which makes this the perfect time to start a new quilt! Pat Sloan issued a Quilt Challenge to her quilting friends: use your scraps to make her Little Wishes quilt. It's a FREE PATTERN. 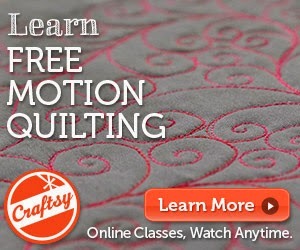 Pat has even added a give-away for those who post a photo of a block or quilt on her website. I dug through my orphan block collection and found eleven other blocks in this black/white/bright color palette. I will eventually stitch them into a baby quilt. I will eventually make 15 more of these and set them with green fabric for a manly throw quilt. Are you ridiculously busy at this time of the year? Consider starting this new quilt challenge. Quilting helps balance out our lives. There are 67 days until I finish my last teaching commitment for 2015. My challenge to myself: try to start less than 67 more projects! I read the first two and then slacked off on the rest. Since I am deep in the throes of the annual Autumn Quilting Frenzy, I need some good books to listen to as I quilt and travel nearly non-stop. I decided to catch up with my reading, starting with the latest. The Count of Monte Cristo is a big book. Huge. I listen to my books while I quilt and this book came in at nearly 53 hours long. I love big books but was worried how I would get through 53 hours of a musty old book. I listened as I quilted, as I packed, and as I drove. The book was so great that I couldn't stop listening to it. I kept an earbud plugged in while I was in stores and restaurants and in the library (picking up a copy of The Count of Monte Cristo movie!). I drove home from last weekend's event with 58 minutes left. I waved hello to my husband and then kept listening while I unpacked, started a load of laundry, and sorted my mail. I knew after the first several hours of listening that I would love this book unless it totally derailed. It didn't. This is now in my top ten favorite books ever. The morning after I finished the book, I ran the Jim Caviezel version of The Count Of Monte Cristo movie on my laptop in my office and quilted while watching/listening. Oh, the disappointment. I've ranted before about my love of The Little Princess BOOK and my disgust at The Little Princess MOVIE. In both cases, the movies are probably just fine but would probably be better served if they had completely different titles. Shirley Temple's The Little Princess could be titled "Cute Little Girl Sings and Dances and Makes Everyone Happy." The Jim Caviezel The Count of Monte Cristo could be known as "No. Just no." It's a fine tale of adventure that was marred by the casting of Luis Guzman. He's a fine actor and I really like him, but he's not quite cut out for a period piece. The book had one flaw, though. I waited 53 hours for Edmond to make a Monte Cristo sandwich. SPOILER ALERT: he didn't. So I did. Look closely at the homemade currant sauce made from berries grown a mile from my house. Be impressed. Confession: I did shop for the ingredients with an earbud in my ear, listening to the second to last hour of the book. I'm going to tackle either Walden or The Maltese Falcon next. I've been warned about Walden. Any advice on getting through that one? I really liked this block from the Jinny Beyer Craftsy block of the month. 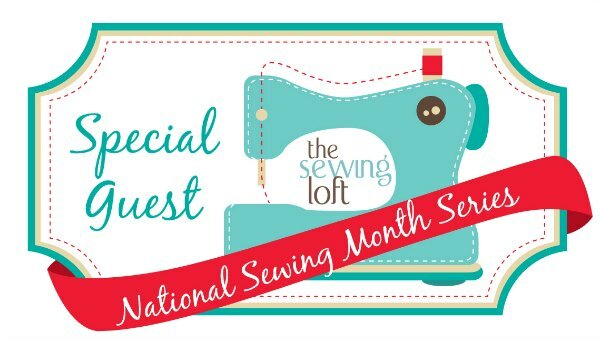 The Sewing Loft is celebrating National Sewing Month with a series about scrap quilting. She featured one of my tips today. I finished another More or Less Quilt, this time using WonderFil FabuLux Fruit Salad thread. I designed this thread line for WonderFil and it will be available for purchase later in 2015. It started with a new pair of quilting glasses. Did you know that needles have holes in them? I can see the eye of the needle now! I used a Handi Quilter Wave F template for the spine, added some swirls for feathers, echoed the swirls 1/4" away. Instead of putting swirls on the other side of the spine, I grabbed my Handi Quilter Mini Circles template and added a line of half-inch pearls. I filled in the background behind the swirls with pebbles but filled the background behind the pearls with parallel lines using my Handi Quilter Right Angle Ruler (my fave!). 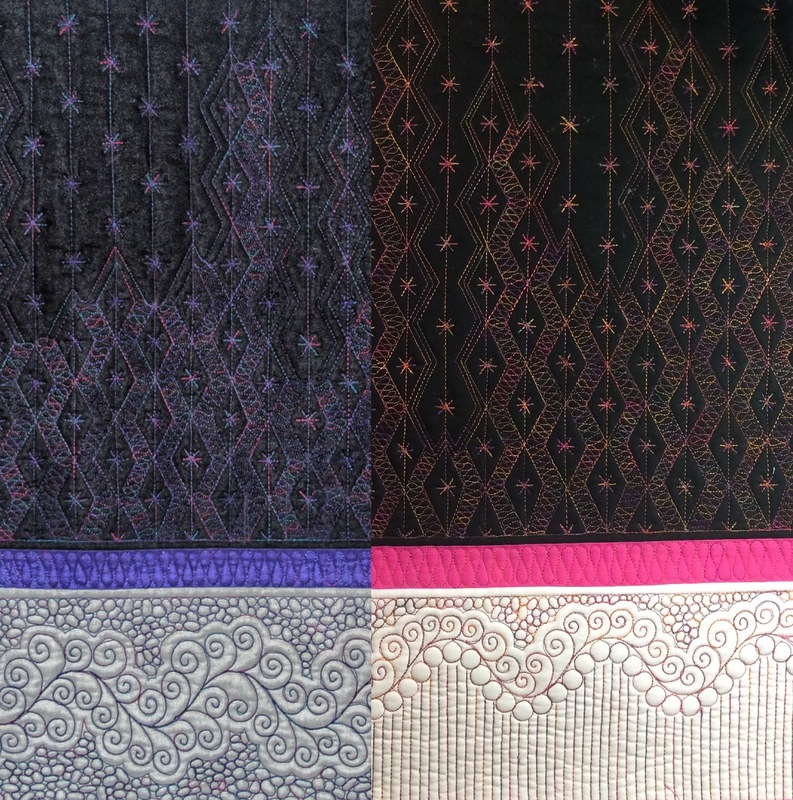 I added some dissolving diamonds in the black fabric using my Handi Quilter Mini Scallop template and then filled the diamonds with asterisks. First Love (left) had very little contrast between the thread and the black fabric. Fruit Salad has more contrast and is easier to see. Fruit Salad has less pebbles and more parallel lines. Fruit Salad has less swirls and more pearls. Fruit Salad has more outlines and less jumpy transitions outside of the diamonds. Fruit Salad has less fabric. I made this quilt much smaller than First Love. I have butterflies and dragonflies on the back of this quilts. Sadly, they are all flying upside down. Let's keep this our secret, ok? Those hippos are facing all directions so I can't get this backing upside down! Six quilts in need of binding and many more in process -- big sigh! I am pushing through and determined to finish my Jinny Beyer block of the month in the correct year. I will admit that I had to make this one twice to get it to this stage. I'm still not thrilled with the centering of the basket and basket brim, but I don't think I can make this one a third time. "I can quilt that out! Right?" If you aren't a machine quilter for hire, this might not be as funny to you as it is to those of us who have been routinely assured that an imperfections will "quilt out." 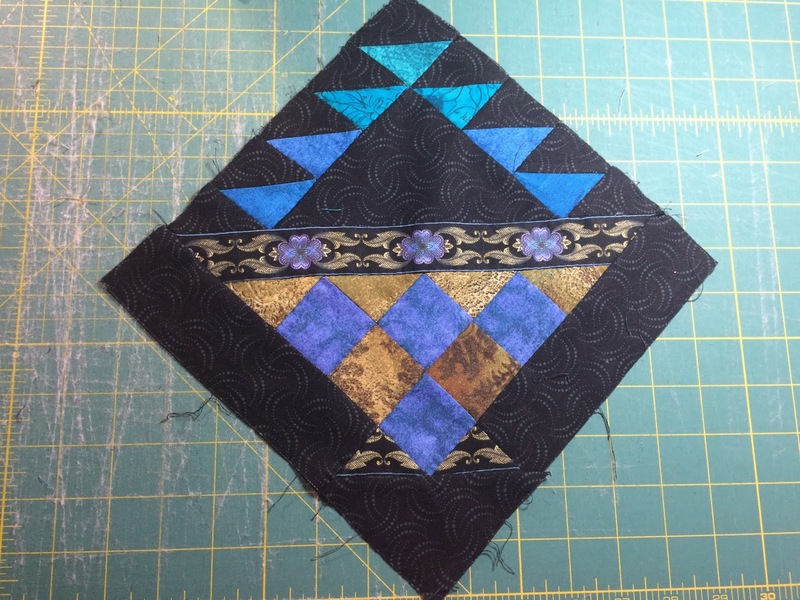 Several months ago, I decided to start Jinny Beyer's Craftsy block of the month quilt. Summer was super busy and I didn't make as much progress as I would have liked, but I am still chugging along. I am hand piecing this quilt and enjoying the process. It's completely different than my usual piecing style which consists of quickly rotary cut, string piece, and use large pieces in simple patterns. I wanted a challenge and with this quilt I GOT ONE!